100,000 strong march in Manchester. 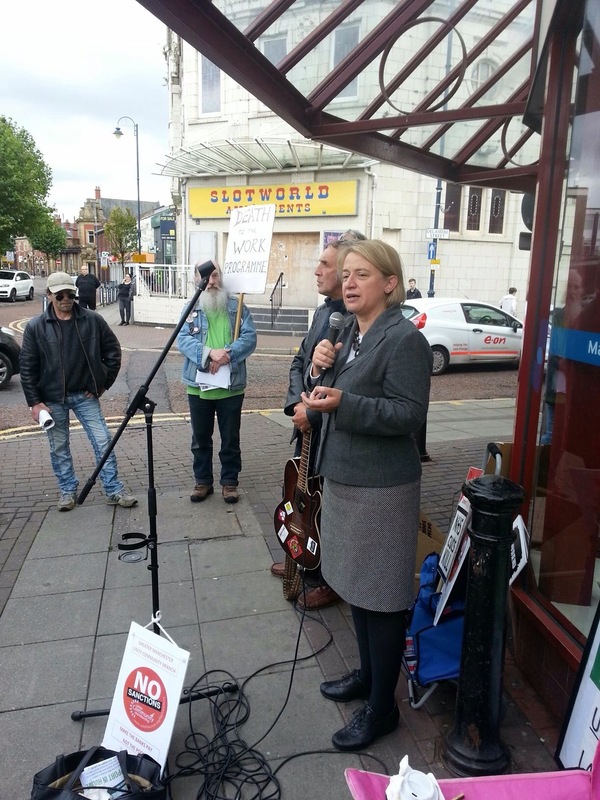 And a visit to Ashton Under Lyne Jobcentre from Natalie Bennett Green Party leader. 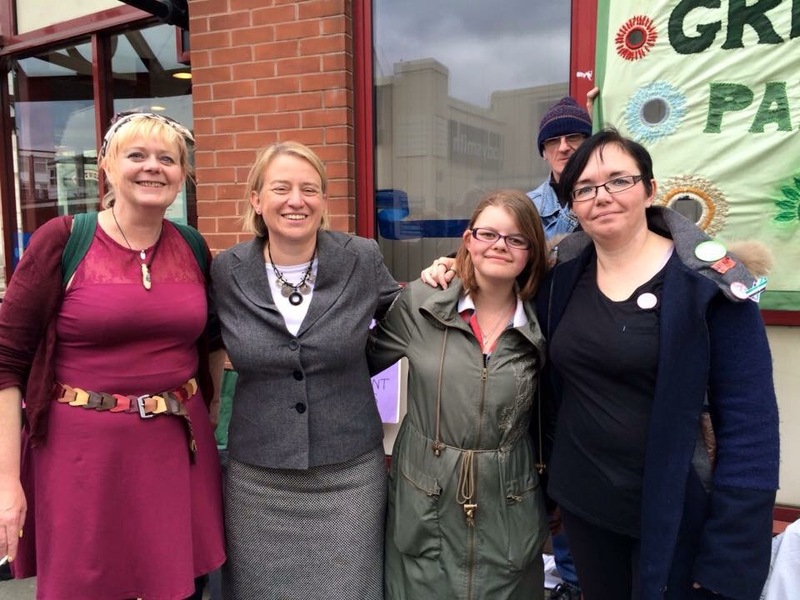 On Sunday I marched alongside 100,000 other people to protest about the Tory Party’s war against the poor and the audacity that they have holding their annual conference in Manchester. It was an amazing day. I regularly take places on marches and did join the last march that was held when the Tory party came to town. It’s very important for us to let them see our disgust at them being there. Manchester city council is a labour controlled council and the Tories do like to come and rub our noses in it. I also suspect that there is an element of coming to gloat, to see what damage they are doing and to remind us of who is “boss”. The arrogance that they have us astonishing but not unexpected. Whilst they engage in childish name calling and jeering we still remain respectful with our heads held high. Folk aren’t happy and they can see this. We held the big March on Sunday then the fantastic DPAC let their presence known yesterday. This group consists of very disabled people and volunteers who take them to events. I am in awe of this group of amazing people. 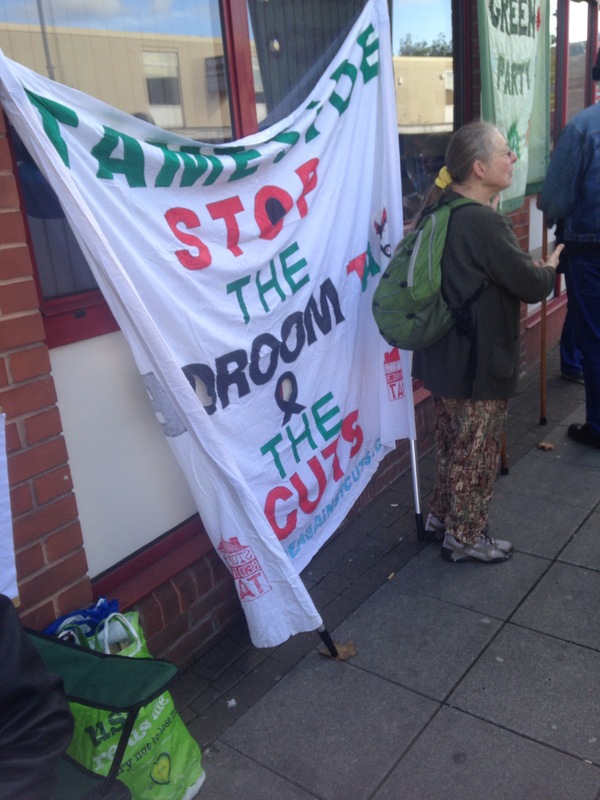 Today there was a blocking of the area near the Tory party conference centre by people campaigning on behalf of the NHS. Mostly doctors, nurses, medical students and campaigners. Again amazing work. 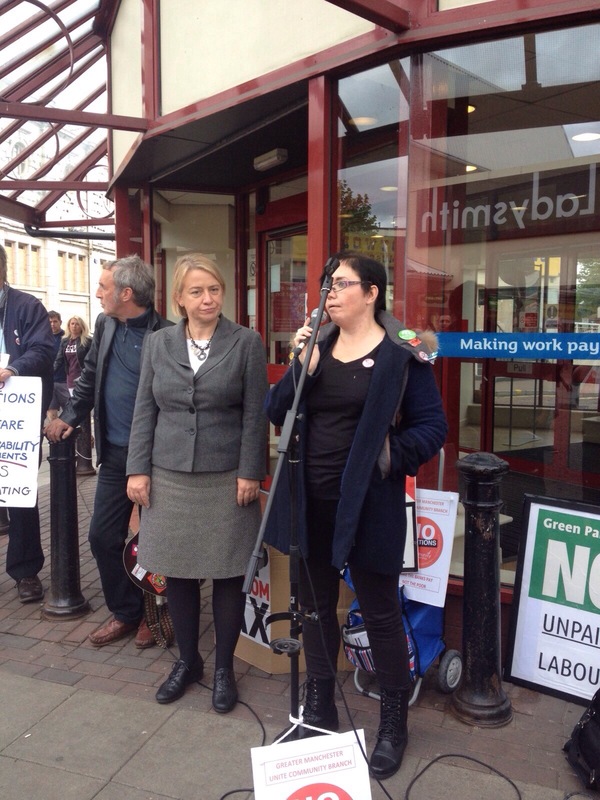 Today Natalie Bennett attended Ashton under lyne Jobcentre to show her support of our campaign which has been constant now for 14 months. Her speech was fantastic and regardless of political persuasion it was great to hear. We needed the morale boost. We work very hard campaigning and to be recognised for that was great. Her support is much needed. 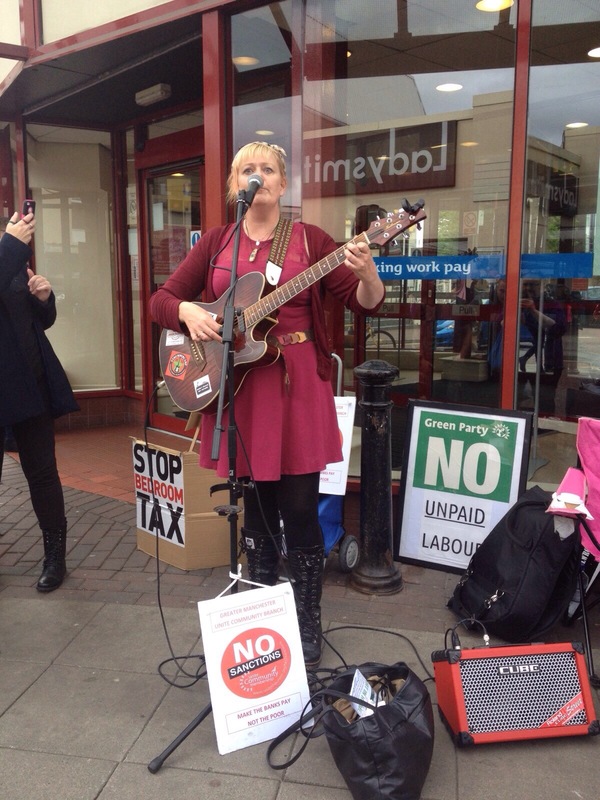 I invited the local press and our local Labour Party but not one attended. 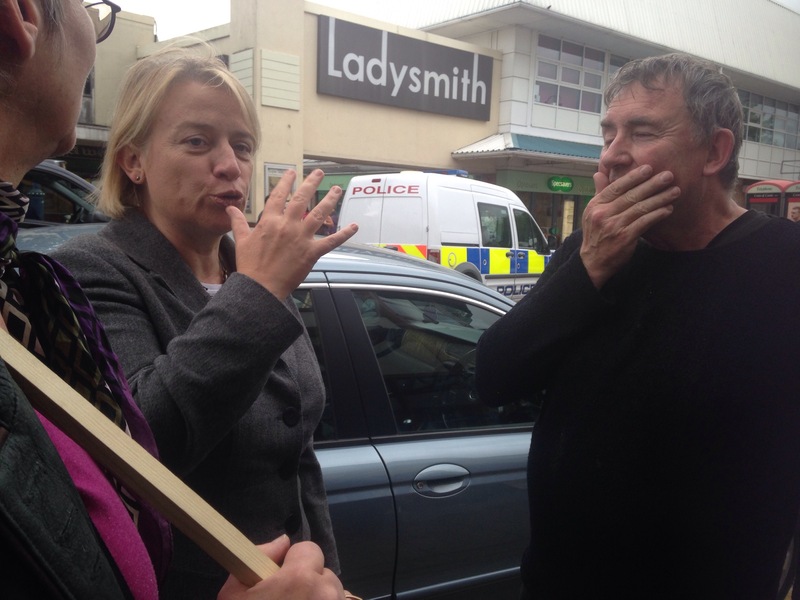 One labour councillors stood across the road for a few minutes but refused to stand with us. We are supposed to be in unity at this moment in time to fight against this oppressive government. I suspect work still needs to be done within local authorities. Thank you to local Labour Party members who couldn’t attend but have shown their support. I also invited the local press to attend. They never showed up either. Very strange. But we are used to that. After a great weekend and an extra day outside the Jobcentre we are tired but it is all worthwhile. 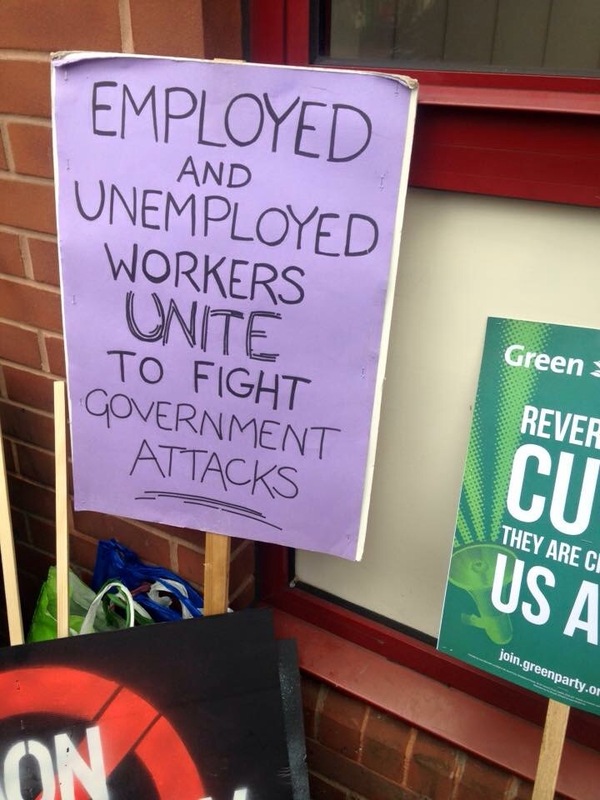 The support from the claimants inside the Jobcentre was great. They were listening to Natalie speak and felt supported. At one point they wanted us to be louder but we were unable to be. 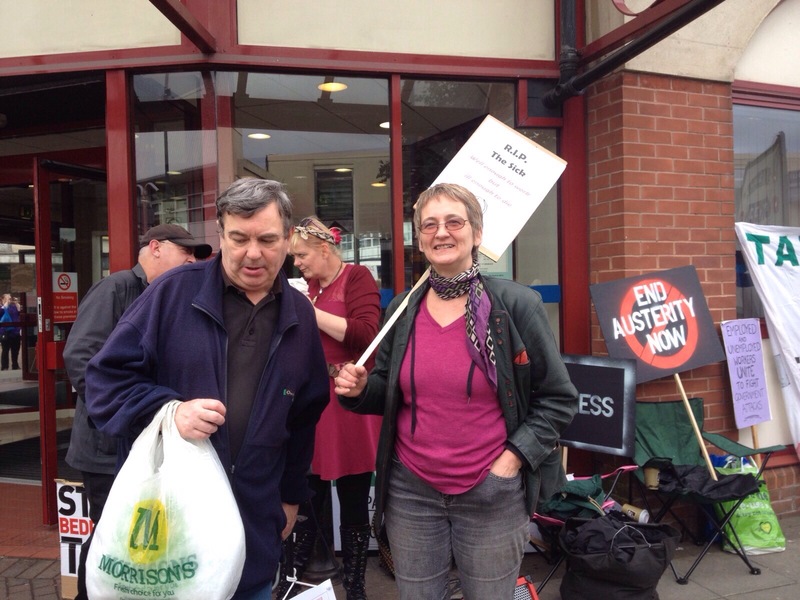 We will continue with our weekly demonstrations outside Ashton Under Lyne Jobcentre. Our demonstrations are a political anyone can join us as long as they are not violent or abusive. Please come and join us. Thanks to everyone for attending and showing your support. We are getting low on leaflets so any donations would be most gratefully received. Many thanks to everyone who has sent their best wishes to my daughter. She has had her biopsy operation and we are now awaiting the results of this. Committed suicide because of a wonga loan. Why should a young person at the start of their life feel like they want to end it? Hi John are you local? Well done to TAC but you are not on the same side as the Labour Party except maybe JCorbyn and a few others. Tameside Labour is still threatening people over jobs at the council, they are up to their necks in downgrading the local hospital and that is just what we know about! I do not believe in local CLPs which will vote for JC but stand by and allow these terrible things to continue and neither will local voters. 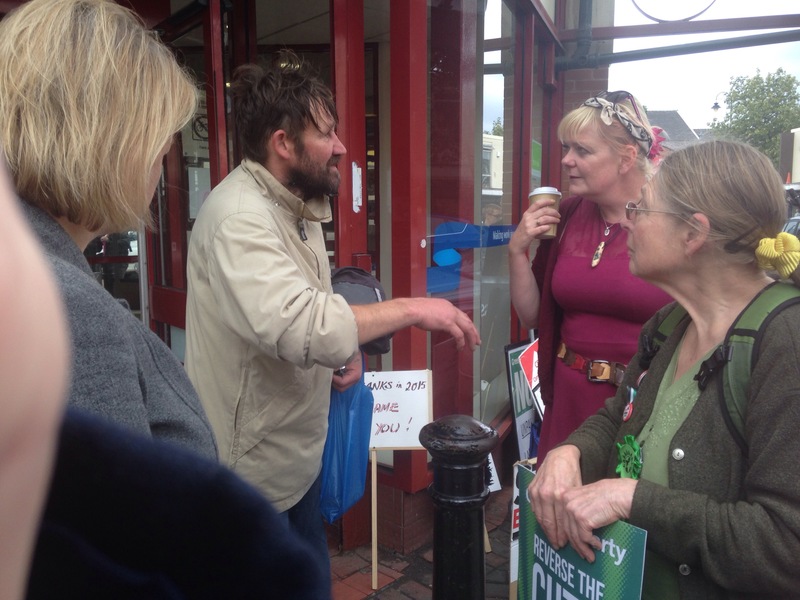 The only way is for the Green Party to take the place and represent and reflect the working class voter in this town. Labour cannot be reformed and I am sure they will be booting JC out as soon as they can. Keep up the good work! 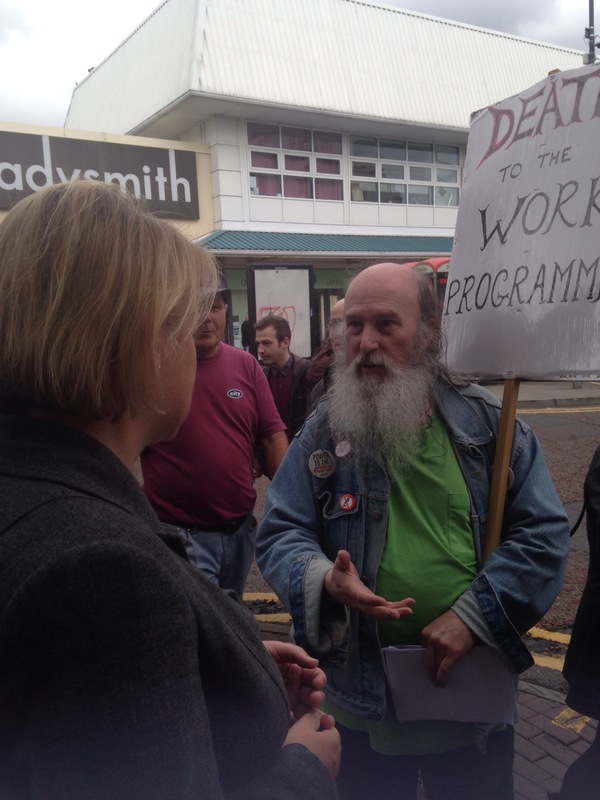 great protest at the jobcentre! These photos really capture it’s spirit! Thank you so much for mentioning that DIsabled People Against Cuts were protesting during the conference, the mainstream media went to great lengths to ignore us and make sure we weren’t visible. 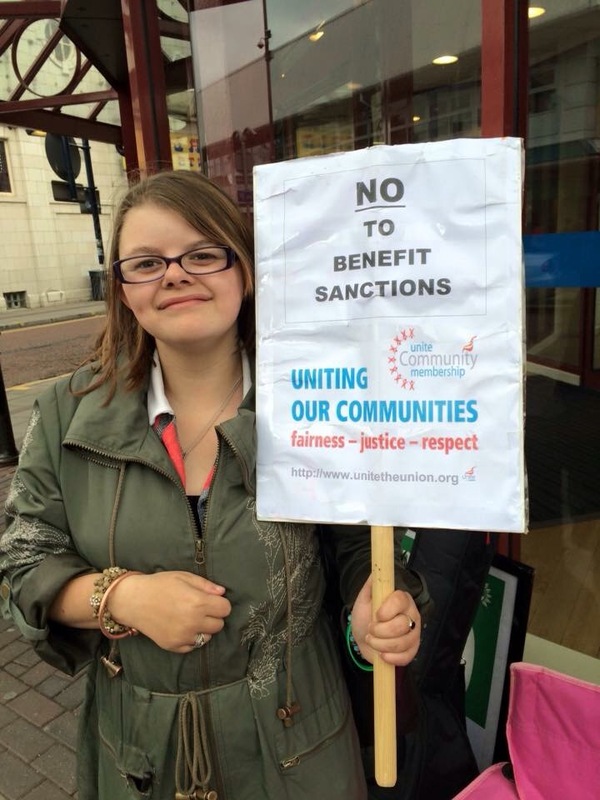 Can I just clarify – DPAC is an organisation OF disabled people, by and for us. We don’t have volunteers who bring us to protests.. we bring ourselves, those of us who employ staff to help brought and paid our staff to do so. All of the DPAC protesters are disabled people, the standing up ones and the sitting down ones. Non-disabled people are not involved in our organisation. One or two allies turn up in support sometimes, in their own right (not taking us there). Thank you so much for supporting our protest! Thank you I’m sorry someone at the demonstration told me that and because they were helping a DPAC member I believed them!! I think that you are all amazing and everyone could learn alot of good from you all. Solidarity always.